This week we attended our third (!!!) baby shower, and each one brings me closer to the realization that this baby can’t stay inside my belly forever. Up to this point I’ve been somewhat in denial about that minor detail. 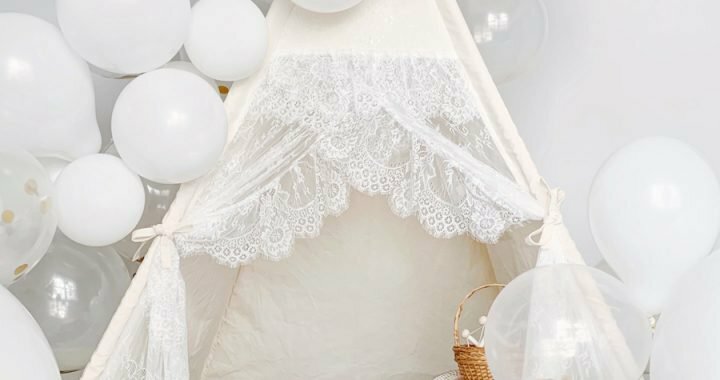 In preparing for her arrival, I’ve combed numerous checklists and asked numerous friends what to pack in my hospital bag. The opinions were all over the place, as to be expected. However, one item agreed on by all was an infant car seat. Until recently, I didn’t even realize the need for distinction between a car seat and an infant car seat. But I’m learning it’s even more complicated than that! In today’s day and age, every baby-related decision requires research – and lots of it. There are simply too many options on the market! Needless to say, putting together the baby registry was quite the experience. 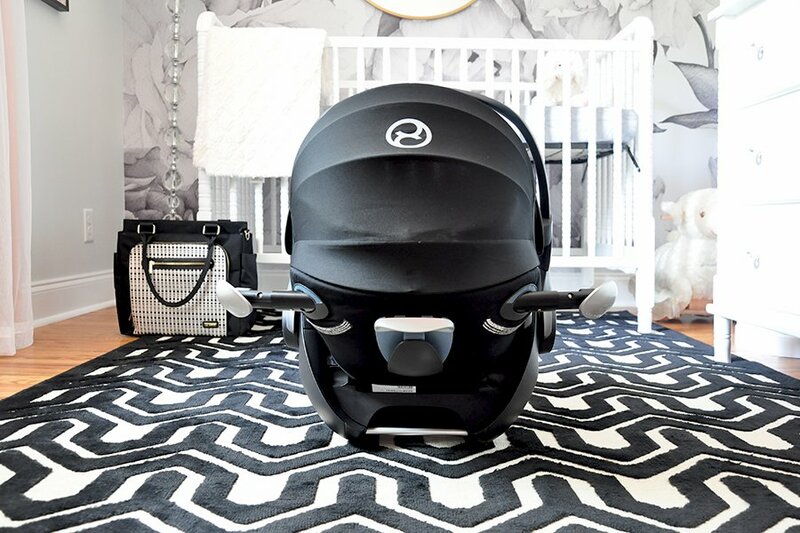 Around the time I began my research, my friends at CYBEX reached out and asked if I’d like to test out their new CYBEX Cloud Q infant car seat. Up to that point, I had never even heard of the brand, to be honest. But that is no surprise, really, because when it came to baby products, I knew very little. Turns out, CYBEX is engineered and designed in Germany, and as a result, far more popular in Europe and Russia than the States. Immediately, my curiosity was piqued. We’re talking about German engineering here, people. As a first-time mom, the thought of driving around town with a newborn gives me major anxiety. Safety features were definitely a priority for me when researching car seats. I was pleased to discover that in tests conducted by Stiftung Warentest, an independent, top German consumer testing organization, the Cloud Q was the only car seat that achieved a “very good” rating (the highest rating) in the “safety” category. One safety feature in particular I appreciate is the load leg that accompanies the car seat. 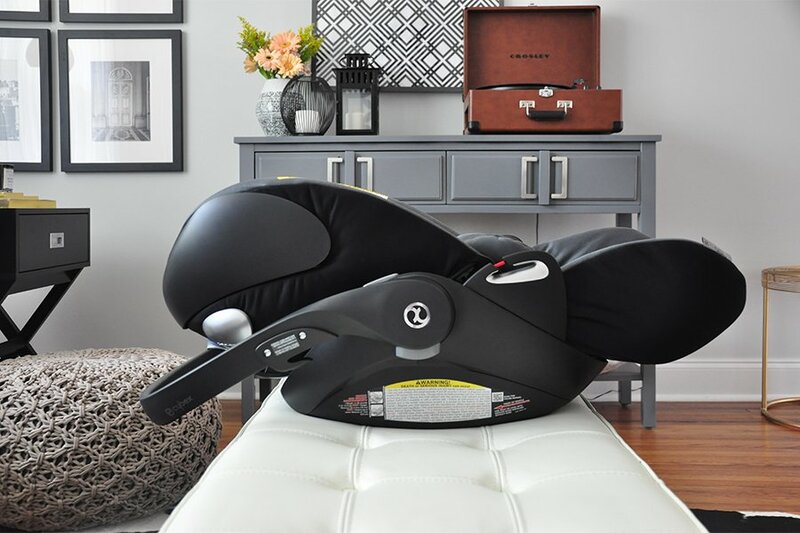 It’s designed to decrease the likelihood of neck strain on the baby in the event of a frontal collision. Plus, it reduces the risk of incorrect car seat installation, which gives this first-time mama a certain peace of mind. The car seat is also equipped with the CYBEX linear side-impact protection (L.P.S.) system that absorbs the force of a side-impact collision. The adjustable side protectors offer an additional layer of comfort and safety, whether you’ve installed the car seat on the left or right side. The Cloud Q seemed to check off all my safety requirements – and more! Next on my priority list was ease of use. Weight is a common concern with car seats that also function as carriers; will I be able to lift it – let alone carry it – with the baby inside? Up to this point, I planned to use a second-hand Britax B-Safe infant car seat borrowed from my sister-in-law. 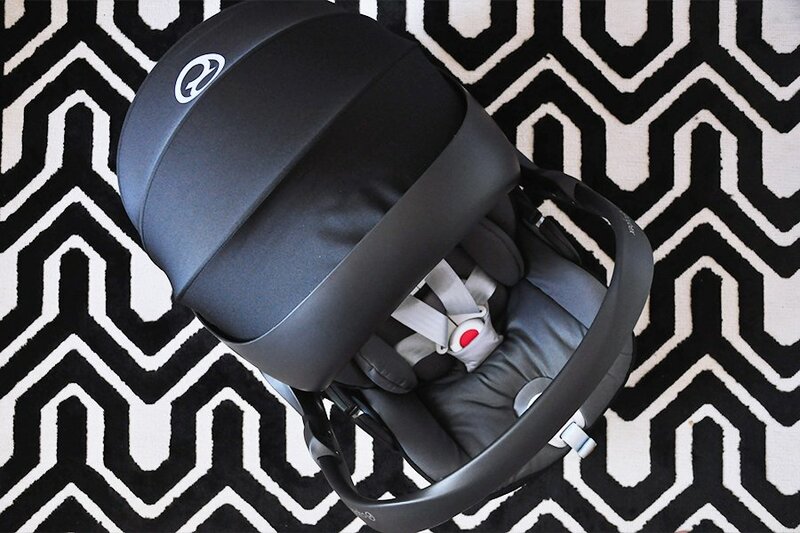 But when the CYBEX Cloud Q arrived, the first words out of my mouth were, “Wow, it’s so much lighter than the Britax!” Imagine my surprise to learn that the CYBEX Cloud Q is 5.4 kilograms, or 11.9 pounds, which, admittedly, is a bit heavier than average. 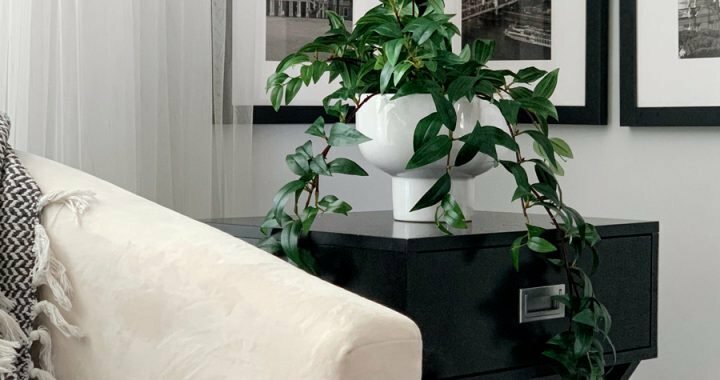 It just goes to show that when a product is ergonomically engineered, it offers far better usability than a product that may weigh less but is not designed with ergonomics in mind. Speaking of ergonomics, I recently learned that infants are supposed to sleep in a fully reclined position to help with proper breathing and spinal development. A new function of the Cloud Q is that it can be changed to a fully reclining position when outside of the car. No other car seat on the market offers this feature! So whether I’m out and about running errands, meeting up for “playdates” with my mama friends (everyone knows it’s more for the moms than the kids, ha!) or doing something around the house, our baby girl can snooze in an ergonomically correct position rather than always being slightly propped up. Last but not least on my list of priorities or must-haves is style. In the grand scheme of things, it may seem silly to concern yourself with how a product looks. 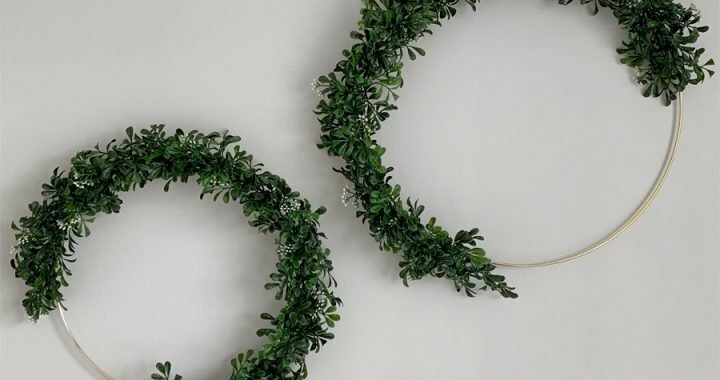 But as I’m quickly realizing, I am not a typical mama-to-be. The obnoxiously bright colors and bulky shapes of most baby products drive me insane. Call me superficial, but if I have to use a product every single day, then I’d hope it’s aesthetically pleasing. Thankfully, the CYBEX Cloud Q does not sacrifice on style. Even the husband commented on how modern it looks! With its clean lines and color-coordinated, futuristic canopy, the Cloud Q is far more aesthetically pleasing than what’s currently on the market. Plus, it comes in 14 different color pattern options. 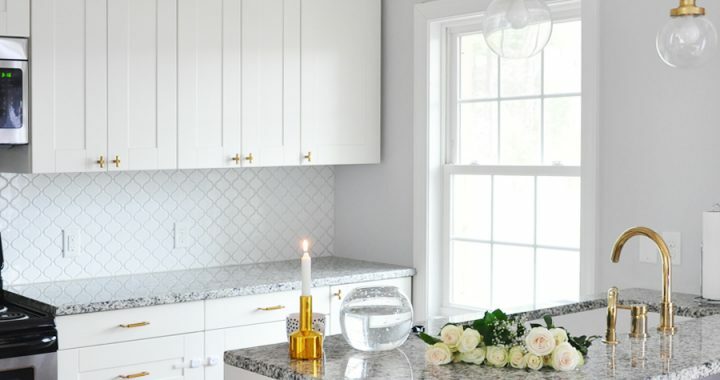 While I instantly loved the “Mystic Pink,” I was practical (imagine that!) and chose a more neutral option: “Moon Dust.” It’s definitely more fun than “Black Sea” but not as flashy as “Hot & Spicy,” making it perfect! So whether or not you’re a first-time mama like me, I’d love to hear from you! What are your must-haves when choosing a car seat for your little one? 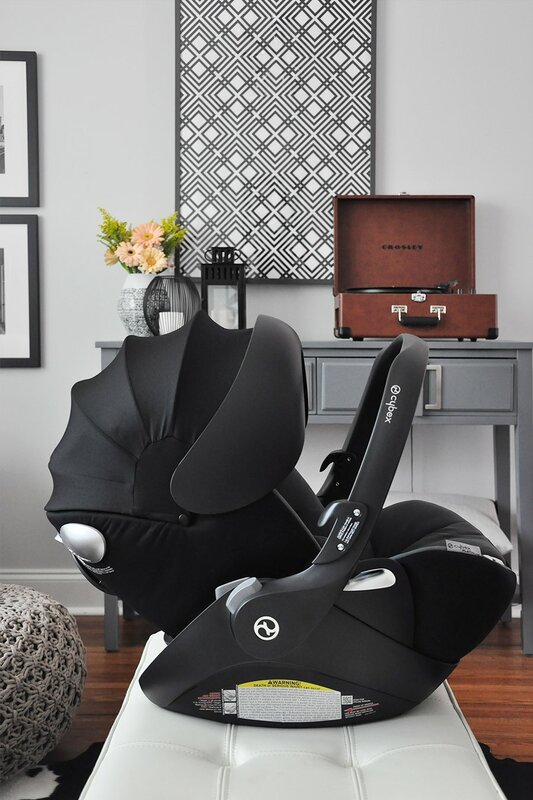 If you have any additional questions about the CYBEX Cloud Q infant car seat, concerns or recommendations, feel free to share in the comments section, below! Thank you to CYBEX for kindly sponsoring this post. All writing and opinions are always my own and never influenced by gifted products or any type of compensation. Thanks for supporting the brands that make FOXYOXIE.com possible! Do you use this car seat with a base? Or do you strap the seat in with the seatbelt instead? 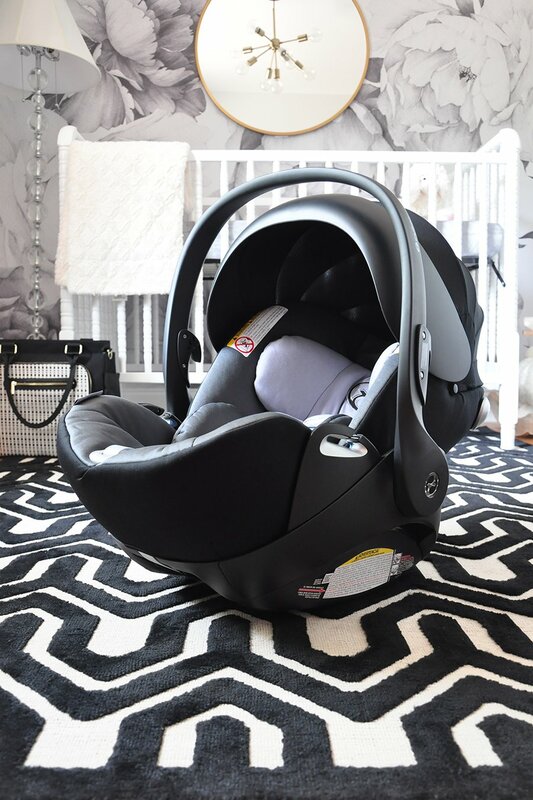 We have been given a Cloud Q car seat and love the safety measures included, but were not given a base and are finding it impossible to purchase the correct base. Hi Marie! Yes, we used the base with the carseat. I found it much sturdier than strapping in the carseat by itself, although from what I remember the side of the carseat shows how an option of using it without the base (our daughter has since moved up to a bigger carseat, so I can’t remember for sure). You can buy just the base on Amazon: http://bit.ly/2vBXu9Q but they are a bit pricey – around $160 I believe – lower than other retailers but still a pretty penny. Hope that helps! You could also try searching second-hand sites like Facebook Marketplace for the base. It’s called the CYBEX Platinum Cloud Q Load Leg Base. Hi! Will it fit in compact cars like a Nissan Juke or Mini Cooper? Hello! 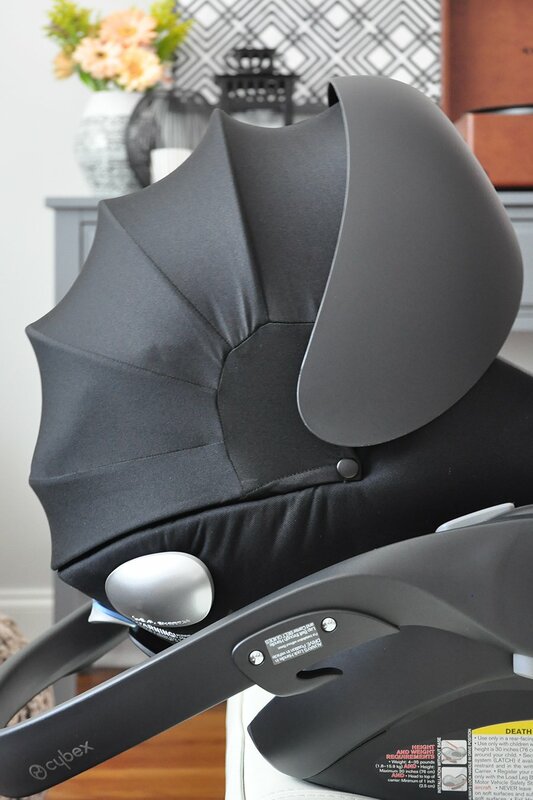 I just purchased a Cybex Cloud Q infant car seat and I am also looking to buy the Inglesina Zippy Light stroller. I can not find the correct adapter to fit the car seat onto the Inglesina Zippy Lighy. Which adapter did you use and where did you purchase?? PLEASE HELP!!! We bought this one: http://bit.ly/2joJTMP. Let me know if I can answer any more questions! Does the Cybex have a stroller attachment? Is it compatible with any stroller bases? Hi Rebecca! Thanks for reading! From what I understand, whether a carseat fits a particular stroller depends on that stroller – not on the carseat, because it’s typically the stroller brands that sell the adaptors. We use Inglesina Zippy Light stroller, and you can purchase a separate Ingesina-branded stroller adapter to make the CYBEX Cloud Q infant carseat fit. So I would check the brand of your stroller for a list of compatible carseats. Hope that helps! Let me know if I can answer any other questions.